Mma Ramotswe is reluctantly persuaded by Mr J. L. B. Matekoni to take a holiday from her detective work. But she finds it impossible to resist the temptation to interfere with the cases taken on by her co-director - secretly, she intends. This leads her to delve into the past of a famous man whose reputation has been called into question, and to join forces with a new assistant detective, Mr Polopetsi. 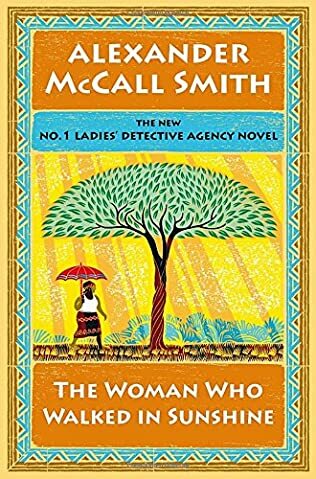 While 'on holiday', Mma Ramotswe also manages to help a young boy in the search for his missing mother; and then of course there is the agency's arch-enemy, Violet Sephotho, scheming to set up a rival secretarial college. In the end, Mma Ramotswe finds that a little trust goes a long way, especially when it comes to having confidence in her dearest friends and colleagues. As always I have enjoyed the easy readability of this book. I had intended to use the description at Fantastic Fiction as my synopsis, but what I found there was so far from what actually happened in the novel that it made me wonder where it had come from - not from someone who had read what I read. So, I am sorry if what I have used above, which came from my local library, is too revealing. I'm sure it leaves plenty for you to find out. Once again there is a basis of home spun philosophy, and a gentle use of quite believable and ordinary stories.